Tag Heuer / Sport / Stainless Steel / 40-44"
The Tag Heuer Carrera Chronograph remains true to its racing inspiration and namesake. 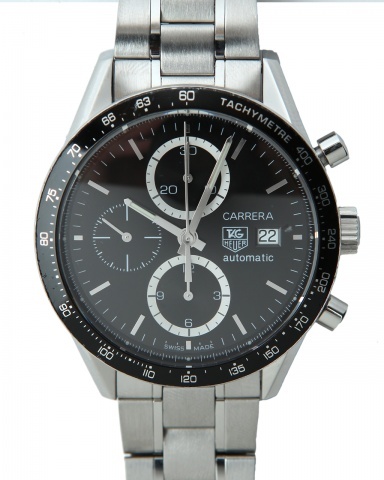 The Carrera Calibre 16 demonstrates its superiority with elegant design, innovative technology, pinpoint precision, and endless durability. The sleek and sporty timepiece will endow the wearer with function and form, transferring effortlessly from the office to the great outdoors. The 41MM case features an automatic movement with chronograph and a black dial with luminescent diamond-set hands and date display at the 3 o’clock position. An anti-reflective sapphire provides optimal visibility in all conditions.